The Stone Center for Latin American Studies invites undergraduates and graduate students interested in Portuguese language and Brazilian studies to apply to its highly popular Summer in Brazil program. 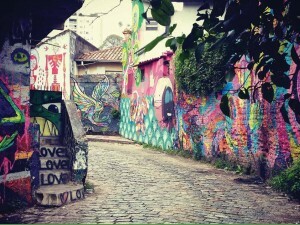 São Paulo, the largest metropolis in South America, is an exciting center for fine arts, theater, music and cultural life. This city is a medley of Brazilians from the country’s 26 states and from multiple ethnic groups, which makes for an exciting mix of traditions and fabulous food on every street. This six-week intensive academic program is organized by Tulane University and Vanderbilt University in partnership with CET Academic Programs and the Pontifícia Universidade Católica de São Paulo (PUC-SP). Students will have the opportunity to earn 6-7 credits and will take one Portuguese language course (beginner, intermediate, and advanced levels) and a Brazilian culture course taught by PUC-SP or CET faculty. Students will stay with Brazilian host families or in apartments with Brazilian roommates in São Paulo for a total Portuguese immersion experience. Excursions and activities in and around São Paulo will introduce students to all sides of Brazilian society. This program qualifies as a FLAS-approved program with 140 contact hours of language instruction. It is available to students seeking credit in intermediate and advanced Portuguese levels only. Student applicants must be in good academic standing and have at least a current cumulative grade point average of 2.5. Non-Tulane students are required to have completed two outside-institution Portuguese language course, or have otherwise reached intermediate-level proficiency if they are seeking credit for PORT 2050. Students may be interviewed to determine their Portuguese language skill level during the application process. Non-Tulane students are welcome to apply, but should confirm with their home university that their credits will transfer. Course syllabi from previous years are available upon request. $2,550: Brazilian family home stays (undergraduates) or apartment housing with Brazilian roommates (graduates) with internet access. One meal per day, transportation from the airport (GRU), medical insurance and specialized group tours and activities. Airfare to/from São Paulo (GRU), incidental costs, and extra meals and expenses are not included in the program cost. This course meets all requirements for Foreign Language and Area Studies (FLAS) Fellowships; students are encouraged to apply to their home institution for summer FLAS Fellowship support. If you plan to apply for a FLAS Fellowship, the application can be found here and is due February 8, 2019. More information and the program application can be found here. Deadline to apply is March 1, 2019. For more information about this program, contact Laura Wise at Tulane’s Stone Center for Latin American Studies. Note that the fellowship application and the program application are separate applications. For information on other summer programs, please visit: CLASP Brazilian Portuguese Summer Programs.